The vocal cords or vocal folds are two sets of tissue stretched across the larynx. They can be placed in such a way that they vibrate when air passes through the larynx. This will produce sounds. Humans can use them to produce language. 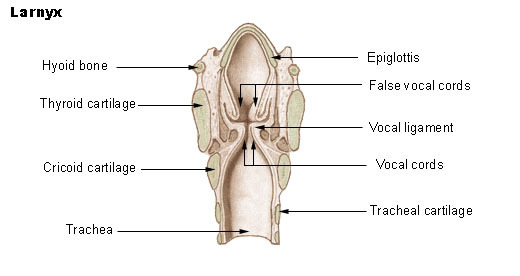 Men and women have different vocal fold sizes. Adult male voices are usually deeper' - males have larger folds. The male vocal folds are between 17 mm and 25 mm in length. 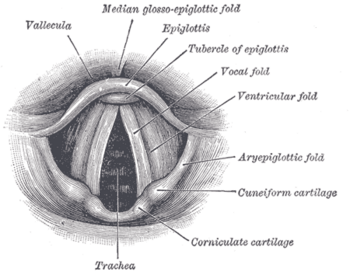 The female vocal folds are between 12.5 mm and 17.5 mm long. Folds are pearly white - females have whiter cords than males. The difference in vocal fold size between men and women means that their voices have a different pitch. Each person's voice is different and has a slightly different pitch. This is caused by genes that influence how the larynx is made. The vocal folds discussed above are sometimes called 'true vocal folds' to distinguish them from the false vocal folds. These are a pair of thick folds of mucous membrane. They sit directly above the true vocal folds, to protect them. They have a very small role in normal speech formation, but are often used in musical screaming and the death grunt singing style. They are also used in Tuvan throat singing. Unlike the true vocal cords, the false ones grow back completely when they are removed by surgery. Vocal folds Facts for Kids. Kiddle Encyclopedia.